Amid a federal agency's looming decision about what to do with a ribbon of land along the Red River it claims, Texas officials are speaking out on the issue. This is how we got here. BYERS — Tommy Henderson’s Chevy Silverado bobbed as he drove recently over the North Texas pasture he knows so well. It was part of the ranch where his family had grown crops and grazed cattle for more than a century. The landscape had changed over time. The cottonwood and salt cedar trees weren’t here when his forefathers arrived. “It was just tall prairie,” he said. And the Red River, which runs about a quarter-mile north, has, at times, snaked closer to this spot, its flow changing with Mother Nature’s whims. 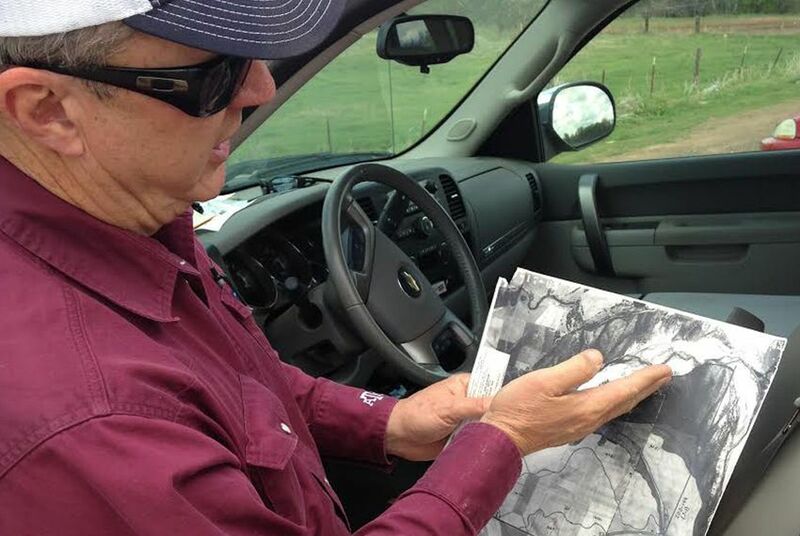 The 60-year-old rancher knew exactly when his truck rolled past the invisible boundary that splits what’s still his land and the 140 acres the courts took away — despite the fact that Henderson paid for it. “We’re on BLM land right now,” Henderson said. Henderson, who is no fan of the BLM, said he’s happy with the attention on the issue. And because of his role in the dispute’s legal history, he has become a point man for those looking to clear up the confusion. He wants more Texas officials to first grasp the two centuries of litigation and changing geography rooted in the dispute. He said they need to know about the Louisiana Purchase, the Adams-Onís Treaty, Buck James, the Langford family and the huge legal ramifications for the different ways a river can move. Only with that understanding can officials try to answer the landowners' new set of questions. The BLM, the federal government’s trustee for nearly 250 million acres of public land and 700 million acres of mineral rights, is updating its resource management plans in Kansas, Oklahoma and Texas — designating how the land will be used for the next 15 to 20 years. 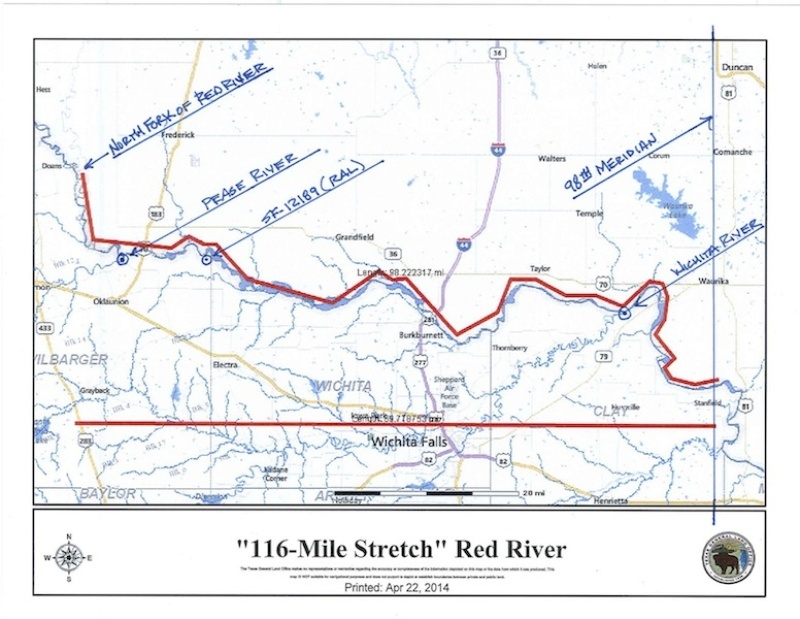 The area includes about 90,000 acres along the Red River that the agency considers public land. Texans, however, have long managed some of that land. They hold deeds to it and have diligently paid taxes on it. The BLM has not fully surveyed the area, so it is not clear how many acres the locals have claimed and how many sat untouched. The BLM’s Oklahoma field office, which coordinates the three-state region, announced plans in July 2013 to form a new management plan and held a series of meetings throughout the region. 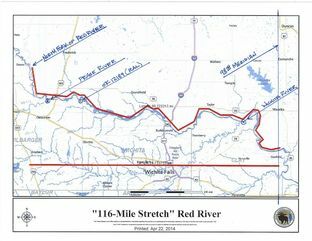 Frustration and confusion have simmered along the river for months, and lawmakers including state Reps. James Frank, R-Wichita Falls, and Drew Springer, R-Muenster, and U.S. Rep. Mac Thornberry, R-Clarendon, were researching the issue before Perry, Abbott and other top state officials began challenging the BLM on national news outlets. BLM officials say they understand local residents’ concerns. But, referencing a series of court opinions, the agency says the land in question belongs neither to Texas nor Oklahoma, regardless of who has used it. The lands "were at no time held in private ownership," said Paul McGuire, an agency spokesman. He noted that the agency was not a party in any of the past litigation. The comments come in the shadow of a headline-making standoff over grazing fees between the BLM and a Nevada rancher named Cliven Bundy — an issue that has little in common with the Red River debate. Frank said he was frustrated by those who try to link the two disputes. “It couldn’t be any more different. That guy is basically feeding his cattle on public land,” he said of Bundy. “That is significantly different than having a deed on a property” that the government later claims. Henderson, who does not stand to lose any acreage under the BLM’s plan, plans to give a tour Monday of the boundary to a group of local lawmakers and officials, including Land Commissioner Jerry Patterson and Lt. Gov. David Dewhurst. The officials will hear a story that starts with the Louisiana Purchase, which gave the U.S. a huge swath of land including parts of North Texas. In the 1819 Adams-Onís Treaty between the U.S. and Spain, the U.S. gained all lands north of what the Spanish called the Rio Roxo. After a century of peaceful cross-border cattle drives and wagon crossings, the 1919 discovery of oil near the line sparked a U.S. Supreme Court showdown between Texas and Oklahoma. The court ruled that Oklahoma controlled lands to the north of the river’s “medial line,” which stretched directly between its north and south gradients or “cut banks,” cliffs the water had carved. Texas controlled land below the south bank. The federal government took control of land between the medial line and the Texas bank because no one had ever parceled it out to either state. That's the sliver BLM now claims. Those boundaries were subject to the river’s avulsion and accretion — terms that describe how a river’s path might change over time. How a river moves matters mightily in boundary disputes. In Texas and U.S. law, avulsion happens when a river suddenly abandons its channel and creates a new river bend, leaving a peninsula untouched by the water (Oklahoma’s definition of avulsion is broader; it only requires a sudden change in flow.) When avulsion happens, a state’s border would stay put, regardless of how much the river moved. With erosion and accretion, a river changes course more slowly, gradually sweeping away the land in its path, without creating an entirely new channel. When that happens, the boundary moves with the river. In the decades following the Supreme Court decision, lands south of the river were sold as parts of Texas, even as the river shifted north. In the early 1980s, Buck James reignited the river fray. The Oklahoman coveted 900 acres of his neighbor’s property across the water. Texas’ Langford family had long assumed it had acquired the land when the river had moved north through accretion. Oklahoma courts awarded James the land, ruling that the river had moved through avulsion during a 1908 flood, meaning that the Texas boundary had not moved toward Oklahoma. A federal appellate court upheld the decision. The U.S. Supreme Court refused to hear the case, and the Langfords never had the chance to present evidence showing that two surveyors testified in 1925 that they found “no avulsive changes” in Clay County or across the river in Oklahoma. Nor did the Langfords have the chance to argue that the courts should have used the U.S. definition of avulsion, rather than Oklahoma’s broader one. Around that time, Oklahomans went after a large slice of the ranch land Tommy Henderson had bought from his aunt for $300,000. That land sat less than a mile from the property James sought. Without requiring a new survey, an Oklahoma judge simply extended the property lines from the James opinion, ruling that about 45 acres belonged to an Oklahoma family, but the rest was public land. Now, the BLM is citing the property lines set by the Oklahoma courts to estimate the river land it owns. In 2000, Congress ratified the Red River Boundary Compact, which set the boundary as the vegetation line along the south bank of the Red River. Texas officials including Abbott have asked the BLM why it doesn’t consider that as the property line. The answer is because the compact only set jurisdictional and political boundaries and had no impact on property lines. “I think that they don’t truly, totally understand everything that’s happening and what has happened,” Henderson, who was appointed to the Texas commission that hashed out the compact, said after reading Abbott’s initial news release on the issue. The BLM has not decided whether it will close off parts of the land or make it open to the public. One option would be to let Texans continue using it, though they would then be subject to federal regulations. Another option would be to sell it. Or Congress could tell the agency to do something else with the land. Some but not all of those options would require a BLM survey, said McGuire, the BLM spokesman, but none is in the works. Patterson, Texas’ land commissioner, said the burden of proving ownership should fall upon the BLM — not Texas landowners. "The BLM cannot just claim ownership of any Red River land administratively," a summary of the state agency's position says. McGuire said the BLM could take no action on the land, but he added that such a move would be irresponsible. The agency says the 90,000 acres include spots that no one has ever monitored, and some spots are vulnerable to folks burning tires, cooking meth and littering. In the coming weeks, the agency will release a summary of local comments that will show a diversity of opinion on the BLM plans, he said. The BLM's draft plan is due within two years. At the earliest, it says it will finalize the plan by 2018. Kenneth Scott, 84, said he wants the land to stay as is. He and his wife live in Wichita Falls, but they frequently make the short drive “just to piddle around” on the roughly 800 acres along nearly a mile of river that his family has tended for about a century. He wants to keep it in the family and, like many of his neighbors, says he feels anxious about what's next. *Editor's note: An earlier version of this story said that the U.S. gained all lands south of what the Spanish called the Rio Rojo in the 1819 Adams-Onís Treaty between the U.S. and Spain. The U.S. gained lands north of the river, which the Spanish called Rio Roxo. Additionally, the story originally stated that an Oklahoma judge ruled that all 140 disputed acres of Tommy Henderson’s land was public land. But the ruling actually awarded about 45 acres to the Oklahomans and the rest to the federal government.